• A charter school student was robbed by two men on the Blue Line as he made his way to class around 8 a.m. Police said the boy was exiting the train at Monroe when the men robbed him of his wallet and then fled. According to the boy, the men are both in their 20’s with one being white and the other Hispanic. They wore black jackets, hoodies, and black hats. The police department did not disclose where the student attends school, but the police report was taken at Muchin College Prep, 1 North State Street. 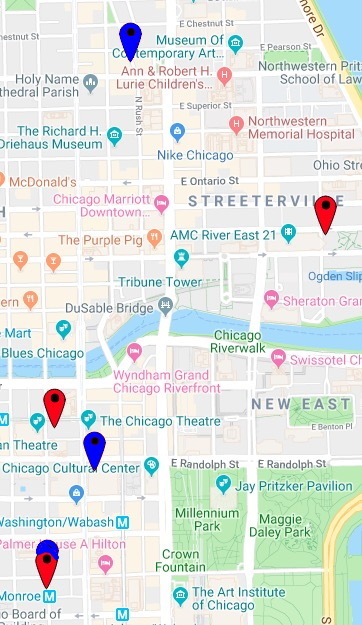 • Then, around 6:30 p.m. Wednesday evening, a woman was mugged and robbed of her phone by three teenagers outside of a parking garage at 181 North Dearborn. According to the victim, the robbers were three black males in their teens with the tallest being about 6-feet tall. They were last seen running northbound on Dearborn. • Finally, around 6:50 p.m., a man was robbed by two men who implied that they were armed with a handgun in the 800 block of North Rush Street, police said. Both men approached the victim near Chicago Avenue, announced the hold-up, and took the victim’s wallet and phone. The robbers were described as two black men between 25- and 30-years-old. One was slim, about 5’8” tall, and wore a red jacket. The other was heavier, a little taller, and wore a black coat. They were both last seen running northbound on Rush Street. In the first robbery on Tuesday, a woman from out-of-town told police that three or four men pushed her several times and stole her purse at the Monroe Blue Line station around 5:25 p.m. She said the robbers were black men who all wore long gray coats. Taken was a black handbag with gold zippers. • Then, around 6:30 p.m., a shoplifter pulled out a handgun and threatened Macy’s security guards who tried to stop him at the retailer’s flagship location, 111 North State Street. Macy’s employees were able to disarm the robber, but he managed to escape and was last seen heading south on State Street. The robber was male, black, 22- to 28-years-old, 250 to 260 pounds, and wore a puffy black coat with fur on the hood, tan cargo pants, black 90’s-era Air Jordans, and a black winter cap, according to the loss prevention officers. • A Streeterville Subway restaurant and one of its customers were robbed at gunpoint around 8:45 p.m. The offender entered the store at 511 North McClurg, pulled out a handgun, and collected the store’s cash drawer, change dispenser, and a customer’s ring, according to a police report. He then fled north on McClurg with the cash drawer tucked under his coat. Video showed the offender to be a thin white or Hispanic man in his 40’s who stands 5’7” to 5’10” tall. He was wearing a dark-colored scarf over his face and a dark three-quarter length coat. Our exclusive and original reporting is 100% reader-funded. Please make a contribution to our operating fund or purchase a subscription today.